This chevron burlap ribbon made from 100% high quality of jute that comes in a dimension of each spool is 2" wide x 10 yards in length. At BB Crafts, we provide our customers with dazzling ribbon features imaginative with zig zags stitched wire edged ribbon. This design allows you to curve, shape and decorate your creations with comfort. However, this zig-zag design is still is in fashion trend for crafters as it is a symbol of the classy look and can use on many occasions. You can easily find the unique collection of these ribbons at our online shop. 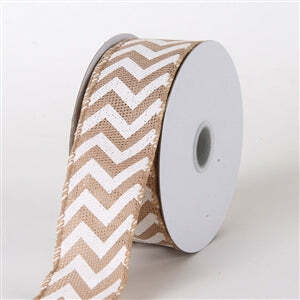 We provide chevron burlap ribbon with wired edges in distinct shapes, sizes, and colors such as Apple, black, pink, yellow, light blue and much more. We all want our customer satisfaction thatâ€™s why we offer the high-quality product at affordable price. On the other hand chevron, ribbon considered being the perfect fabric for your wedding accessories and designs or craft projects. Transform any project with a touch of burlap that used to give a stunning look to your object.